When I started reading this book, I was impressed. The story begins with main character Zara travelling to stay with her grandmother in a small Maine village. Her stepfather has just passed away and she is so overcome with grief she has become numb. I really enjoyed the first part of the book, where Zara slowly, with help of her grandmother and new friends in Maine, returns to her old self. There was a lot of emphasis on her feelings, and these scenes were very well written. But not everything in Maine is sweet happiness. Zara is stalked by a freaky guy that does nothing but point at her. Her stalker actually kind of freaked me out. I enjoyed the mystery and was eager to find out who he was and why he is following her. However, the closer I came to solving the mystery, the less interesting this book became. Zara’s personality seemed to be subordinate to the action and the suspense. We just flit in and out scenes but nothing really stands out. Her personal thoughts are about gone, except for a few scenes with her love interest (that has a big secret of his own) that were al right. You can’t tell from the blurb, but this is actually a paranormal themed book. There are bloodthirsty pixies and weres with a hero-complex. The lore seems pretty interesting, at least it’s nothing I have ever read before, so I would have loved to know more about where these creatures came from etcetera. I hope this will be explained more detailed in the next book of the series. Even though the book kind of fell flat for me halfway through, I still enjoyed reading it. Mrs. Jones has a certain ease in her writing that makes the book really pleasant to read. I’m very curious to see if the next book in this series is better. 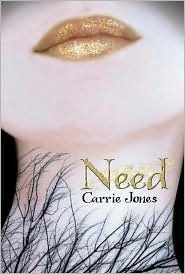 If you’re looking for a cute paranormal romance for young-adults, you could try Need.